XVI, 260 S., 15 Abb. This is an interesting and stimulating book about the use of pictures – both still and moving – in the propagation of the U.S. postwar empire. Sönke Kunkel argues that “pictures […] became a key resource” in the consolidation of this empire “because they created sensory experiences of American superiority and thereby strengthened global recognition of and for American leadership” (p. 3). While Kunkel acknowledges that other empires have created visual manifestations of their power, such as statues and triumphal arches, he insists that the visual display of American power was different for two reasons. First of all, the fact that the United States had an informal empire “limited the representational options, ” not only because Washington could hardly build triumphal arches in the capitals of its allies, but also because the message of power had to be tempered by values. Secondly, however, the spread of visual media and their global distribution compensated for this limitation because representations of American power and values were virtually ubiquitous (pp. 6–7). With this focus, Kunkel contributes to several historiographies: first of all, to a growing body of literature on visual history, the history of pictures and their uses. Furthermore, he enriches our understanding of the uses of soft power in the consolidation of hegemony and empire. At the same time, his work makes an important contribution to media history (even to more specific questions such as the role of the media during the Vietnam War) and finally, as Kunkel is keen to emphasize, to a growing focus on the history of emotions because he also intends to trace viewers’ reaction to the visual representations he discusses. By measuring this reaction in a number of foreign countries – Argentina, India, Tanzania, and West Germany – Kunkel also follows the recent trend of taking a trans- and international perspective on U.S. foreign policy. To realize this ambitious overarching agenda, Kunkel has consulted an impressive array of published and unpublished primary sources in the relevant countries (even though U.S. sources, particularly archival ones, clearly dominate the bibliography). In the first part of the book, Kunkel sketches what he calls “the rise of the visual age,” U.S. policymakers’ realization that the image, increasingly mass-produced and mass-distributed, had a particular appeal and function in conveying key messages. He traces this development from the First World War to Nixon’s White House, where the use of images was professionalized and institutionalized by adding television and communication offices to the more traditional press office. 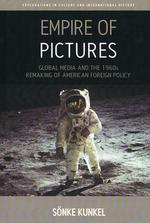 The second chapter traces the parameters of foreign reaction to the American “picture offensive,” first of all as this reaction was channelled by the United States Information Agency, and secondly as mass media became global, which meant that local media procured images of American empire by themselves. These two chapters are the methodological foundation of the main body of the book, which consists of a number of case studies illustrating the key messages of America’s Cold War empire. “Prosperity” discusses how state visits morphed from opportunities for substantive diplomatic discussions into spectacles designed to awe visitors, particularly those from the Global South, and produced images that communicated this encounter of differentiated power. Washington’s Mall, for example, became a welcome backdrop because its monuments not only communicated the metropole’s power, but also – with the Lincoln Memorial – its concern for the emancipation of mankind (p. 63). Symbols of American technological achievements and knowledge, on the other hand, conveyed the benefits that the Global South could derive from a close connection to the United States. The next chapter, “Progress,” focuses on modernization efforts as further opportunities to demonstrate American benevolence and technological superiority. Travelling photo exhibits, picture stories, advertisements, and even cartoons illustrated the benefits of U.S. development. While Kunkel echoes much of the recent literature on 1950s and 1960s modernization in this context, he credits U.S. planners with more cultural sensitivity than other authors. In India, for example, they adapted the local practice of symbolic map-making, which had traditionally filled maps with figurative representations of gods, rivers, etc. American planners replaced those images with “India’s new icons of national advancement: its dams and power stations, modern agriculture methods, and centers of learning” (p. 97). The final two chapters revert to more traditional examples of national power – the space program in “Peace” and the Vietnam War in “Power.” Much of the chapter on space flights details the well-known story of how the launch of the Sputnik satellite in 1957 jolted the United States into action and shifted the Cold War competition to outer space. More interestingly, Kunkel details how the United States turned its national space program into a global event through images, traveling exhibitions of space capsules, and finally, via television, the 1969 moon landing. This universalism, Kunkel contends, emphasized the key message of Washington’s peaceful purposes (p. 125). While all of these chapters illustrate impressive successes of this “image offensive,” the last chapter demonstrates its limits. If the globalization of media meant that Washington could broadcast its message everywhere, it also meant that non-American media could source their own story. And this is what they increasingly did in Vietnam. Far earlier than American media, Kunkel emphasizes, foreign media brought back critical stories and images that played a crucial role in mobilizing allied publics against the United States. By losing control of the pictures (and the media), Washington also lost control of the story it wanted to tell about Vietnam. Somewhat incongruously and also without verifying documentation Kunkel concludes the chapter by emphasizing that the war still “consolidated American empire” because it demonstrated the awesome power of its weapons. This conclusion fails to convince given the crisis of American power in the 1970s. On the whole, Kunkel manages to show that pictures were an important weapon in the soft power arsenal and that policymakers came to realize and use this asset. Nevertheless, his implicit McLuhanesque observation that the media became the message sometimes seems a bit overwrought. Demonstrating the centrality of images works better in some chapters than in others. Whereas it is readily apparent that people needed images to comprehend the magnitude of the space program, iconography was less central in other contexts – e.g. in state visits or modernization projects where the message still seemed more important than the medium. Methodologically, it would have been helpful to learn even more about foreign reactions, particularly since Kunkel’s claims about the impact of such image campaigns tend to be quite sweeping. The book clearly is strongest when the author details such reactions, as with the space program. Finally, in terms of action and reaction, the last chapter contains a surprising perspective shift. Whereas most chapters investigate Washington as actor and conveyor of images, the last one analyses foreign media campaigns and their respective impacts at home. This left me wishing to read more about why the official story and official images no longer fulfilled the function that they had at the height of the Cold War. Nevertheless, these are minor quibbles with a book that is fascinating and easy to read, well researched and nicely illustrated. Kunkel has made a very good contribution to the still growing field of visual history. Fabian Hilfrich: Rezension zu: Kunkel, Sönke: Empire of Pictures. Global Media and the 1960s Remaking of American Foreign Policy. New York 2016 , in: H-Soz-Kult, 07.11.2017, <www.hsozkult.de/publicationreview/id/rezbuecher-25742>.